The 2000s were the worst decade for gender integration since the 1950s. 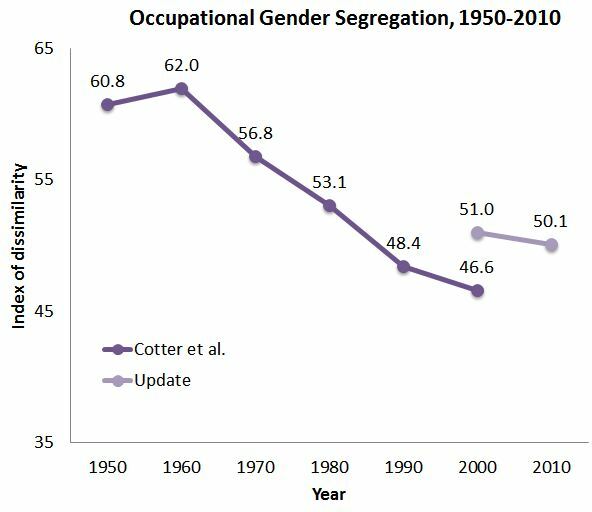 It’s not easy to track long-term trends in segregation, because our measurements are affected by the level of detail used to record occupation titles, by changes in the composition of the labor force, and by the type of measurement used. However, comparing one time point to another using the same data source and measurements is the safest bet. That’s what I have done for 2000 and 2010 (using Census data from 2000 and 2010). A 2004 report by my old colleagues David Cotter, Joan Hermsen and Reeve Vanneman last did that for 1950 to 2000, using a system of coding occupations according to the 1990 standard. I have graphed their results with my new calculations, which use the 2000 Census standards. Since these use new occupation definitions, and a greater number of occupations (more than 500), my segregation score is a little higher. But it’s the decade-to-decade changes I’m interested in. This measure, called the index of dissimilarity, shows the percentage of men — or women — that would have to change occupations in order for every occupation to the have the same gender composition. The graph clearly shows the declining pace of progress toward integration in the 1990s, compared with the 1970s and 1980s, and now we can see the 2000s showed slower progress still. In the last decade, there just was a smidgen of change — just enough so that, if it continues at that pace, we will have complete gender integration… by the middle of the 26th century. What does this level of segregation look like graphically? Here are two takes on that, using the 2010 Census data on about 500 occupations. First, I broke the workers up by gender and sorted them into occupations according to their percentage female (or 100-male). The histogram shows the distribution of men and women across 10 categories, and I labelled each category with the most numerous occupation it includes, such as truck drivers in the under-10% group, and secretaries in the 90+% group. 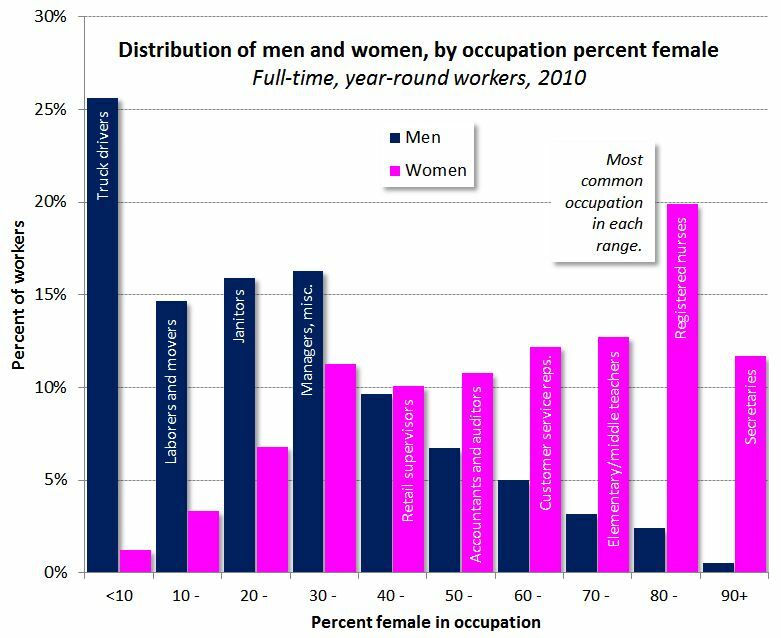 For another view, I lined up all the men and women by occupation from least-female to most-female, and traced their cumulative distributions. This shows the complete distribution for each group. I labeled some key points for comparison. Why is there still so much segregation, and why has progress toward integration stalled? One thing to consider is education. Much of the earlier progress toward integration has come because women increased their share of college graduates, for whom integration has been faster. But without more change in the distribution in majors, that source of progress may have run its course. Another thing to consider is cultural attitudes. Trends in public attitudes are complicated. People are born and die, education levels rise, ethnic composition shifts, and so on. Unlike a simple poll like most in the news, the GSS includes lots of demographic and other information about its respondents, so analysts can try to sort it all out. The lack of a ready structural or broadly ideological explanation of the mid-1990s shift strengthens the case for a specifically antifeminist backlash in the popular culture as the most likely explanation for the attitude shift…. We argue that the result has been not a reversion to the gender traditionalism of the 1950s but the rise of a third cultural frame of “egalitarian essentialism” combining support for stay-at-home mothering with a continued feminist rhetoric of choice and equality. We believe this cultural explanation is also consistent with the broader pattern of gender changes that also shifted in the mid-1990s. Those changes include not only gender segregation, as we see more and more, but also employment levels, wages, political representation, and the division of housework. It’s a compelling paper, essential reading for those with a research interest in gender inequality. *Note: Those with advanced interests in gender segregation measures might like to know I also calculated the “size-standardized index” of dissimilarity for these education data, since some majors are much bigger than others. That measure looks worse, increasing from 35 to 38 over the decade. The omnipresent choice rhetoric serves to obscure the real barriers to equality. Thanks for an eye-opening post. This graph is a great example of why margin-free measures are helpful. Yes, the share of degrees going to women increased in many fields, but you’d expect that if the share of all degrees going to women also rose (which it did, no?). That’s not resegregation, that’s a margin shift. 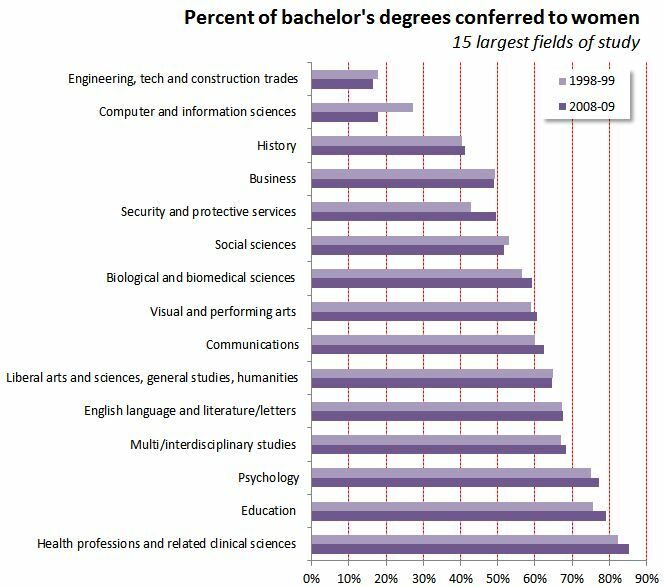 It’s also pretty easy to come up with plausible compositional stories about the three fields where the share of degrees going to women declined. I’d bet that in the social sciences, for example, the share of econ degrees grew relative to soc or anthro, shifting the overall social science % toward men. Similarly, the decline in women’s % of CS/IS degrees may be due to the waning popularity of pre-librarian degrees (“info science” at many schools) relative to CS/computational IS. The third field with a declining % of women, engineering/tech/construction, is such a grab bag that the decline is also plausibly compositional. You’re probably right that there’s not much change. But the graph is a bit misleading, at least if it’s interpreted as evidence of resegregation. Oh ye of little faith! I thought of that, but thanks for asking. No. In the list I used the percent female increased by less than half a percent, from 56.8% to 57.2%. For the composition stuff, your guess is as good as mine. Interesting to see the gender statistics on majors, especially to see which one is around 50%: social sciences. 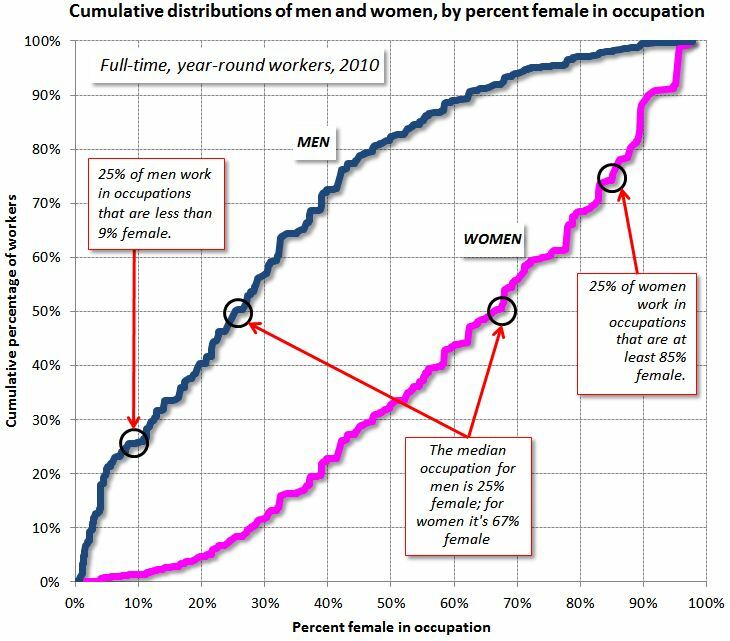 The story I’ve always heard about the social sciences is that there are more women than men, but it turns out that it’s pretty much equal! Does that mean that people are expecting more men, and the even gender balance seems skewed in comparison?